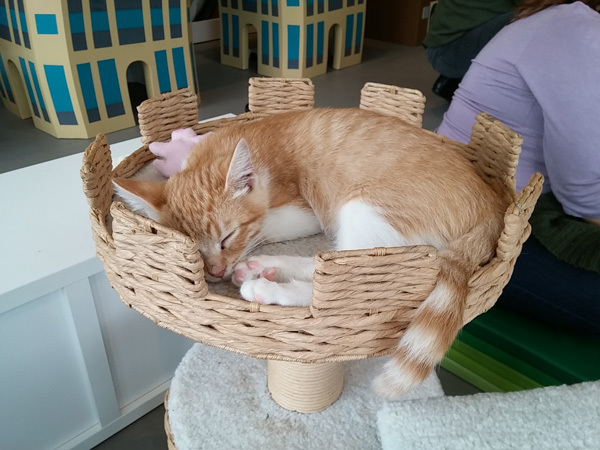 Whether you’re a cat lover, cat enthusiast, mildly amused at felines, or just looking for a place to chill and see what the hubbub is about, the Oakland-based Cat Town Café & Adoption Center is the place for you! 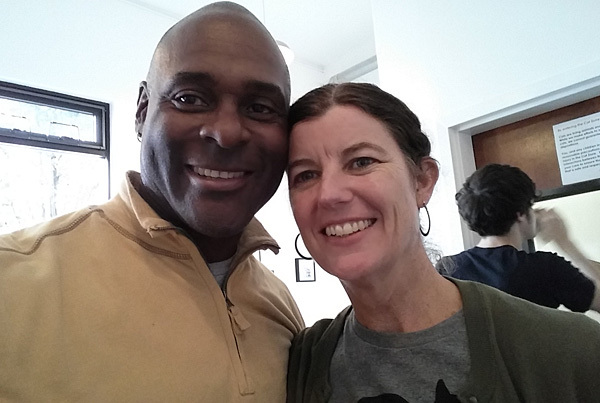 Billed on its’ website as a collaboration between Cat Town founder/president Ann Dunn and co-founder Adam Myatt, the “Cat Man of West Oakland“, the Cat Town Café & Adoption Center provides a communal space for at-risk cats AND there hopefully soon-to-be adoptive humans to meet and play in a relaxed, cat-centric environment. It’s an ingenious method for cat adoptions that utilizes the idea of “community” on a couple of different levels, and to great effect. Typically, rescue animals in shelters are housed individually in cages or small rooms. While this works for a one-on-one interaction with an animal, it may not be the best way to see how the animal fares in a setting more akin to a family’s home. 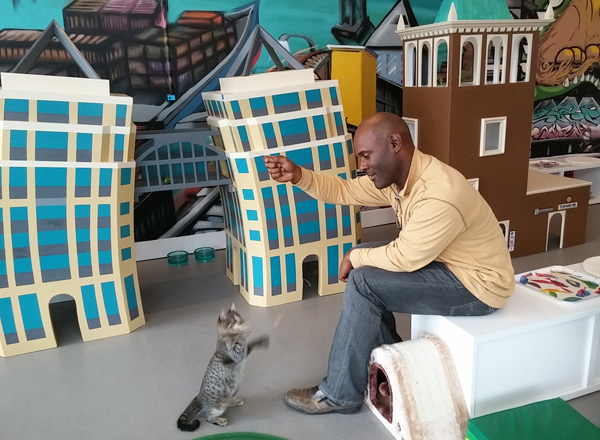 By contrast, the Cat Town “Cat Zone”, with its’ colorful cat buildings and graffiti-esque murals, provides a wide open space where potential guardians can interact with the cats while also seeing how they interact with others. There’s also something to be said for the interactions between the numerous Cat Zone visitors. Though many of them are already (or soon-to-be) cat lovers, some folks come just to hang out on their lunch break. 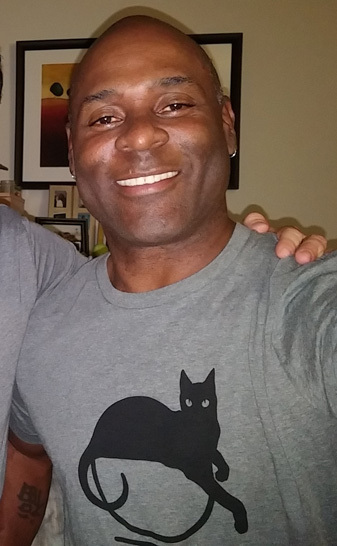 I met quite a few during my visit, and swapped several amusing stories about our respective feline friends. 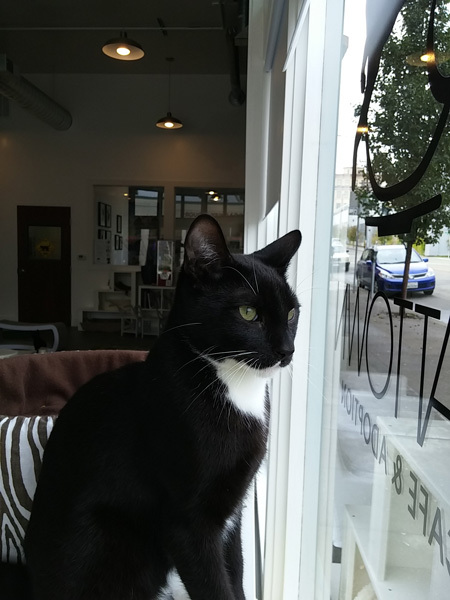 Given that type of environs, it’s easy to see how someone coming in to adopt a cat, perhaps with a few questions and a bit of trepidation, might be more inclined to do so after having a similarly positive interaction with the helpful volunteers, staff, and other Cat Zone visitors. They become invested: not just with the cats, but with the greater Cat Town community. To that end, they screen incoming cats in order to find the best Cat Zone candidates. After all, it doesn’t help anyone if a shy (or aggressive) cat is put into an environment that doesn’t show them in their best light. Volunteers are also screened, but Ann is clear on not making good people jump through multiple hoops to help the Cat Town cause. I could go on and on about all of the various aspects of Cat Town, but it’s probably best if you can go check it out for yourselves. 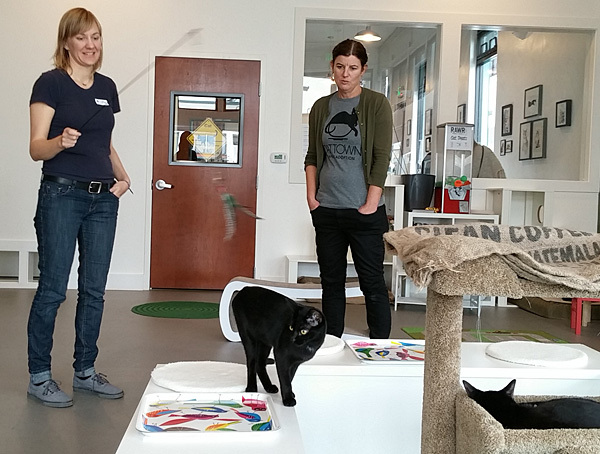 You can book Cat Zone reservations online with ease, or take your chance on finding an open walk-in slot (off hours are best). There’s a requested donation of $10 per hour block of time and, trust me, it’s well worth it. Especially if you come away finding “the one”. 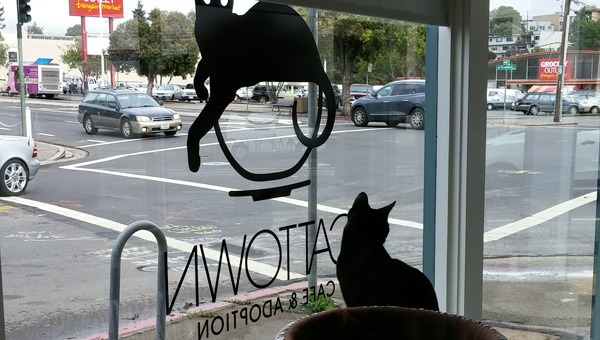 If you’re not able to get into the Cat Zone while you’re there (or just want to do a quick drive by), you can grab a bite to eat from the awesome selection at the café, and nosh while watching the cats through a viewing window.